Q: Do I need to take both Part 1 & Part 2 to be certified? Q: What is the difference between Part 1 & Part 2? A: Part 1 is the home study, classroom, and pool ONLY portion of the certification process. Part 2 is the open water training dive portion (4 total dives over two days) of the certification process. Both Part 1 & Part 2 need to be successfully completed to earn your PADI Open Water or Jr. Open Water certification. Q: It’s winter and I’m (we’re) going on vacation to a warm weather destination – how can I get certified? Come do Part 1 with us (home study, classroom and pool)! Then take the training materials that we have signed to a PADI dive shop anywhere in the world to do your referral Open Water Training Dives. This is known as the Referral Process and it works GREAT. You don’t want to spend your vacation in a classroom – do you? Of course not. Come and receive your Part 1 portion of the course with us and then dive in a beautiful tropical environment for your Open Water Training Dives. How cool would that be? Then once certified, dive to your heart’s content (within your level of training and safe diving practices, of course). If you had to procure a physician’s signature to dive, please make a copy of the document to bring with you to the PADI shop where you will be doing your referred dives (see Medical Statement below). Q: What is the classroom and pool fee (Part1)? The classroom and pool portion is $259. This includes all study materials (PADI Open Water Diver Manual, DVD, log book, and student file), classroom review, pool skills practical application, use of scuba equipment. Alternatively, the home study portion of the course can be done via PADI online eLearning program which costs $309 ($174 paid to PADI and $135 paid to Aquaventure). Q: How long does it take to complete my home study? Generally 8-14 hours is all that’s required for home study but that time can vary. There are only five chapters that need to be read prior to class. Our PADI Open Water classes generally have 8 students with a maximum of 10. Each Part 1 class with 4 or more students will have an additional PADI Divemaster assist with the pool portion of the class. We provide top of the line Aqualung equipment for your pool (Confined Water) and Open Water training. This includes tanks, weights, BCD, regulator, alternate air source, and air integrated dive computer. While we will provide all of the equipment listed above, you need to bring your own mask, snorkel, and fins. A custom fit of your mask, snorkel, and fins is incredibly important for your comfort and safety,You should consider these items in the same way you consider your toothbrush when traveling – you want to bring your own – trust us on this! We have a full range of scuba rated equipment with a very knowledgeable staff. We urge you to come into our store before the class to get properly fitted with your equipment. Please make sure that you have scuba-rated fins. Fins that you may own for snorkeling may not be powerful enough to “drive” a full set of scuba gear. The days of your class you will need to bring a swimsuit and a towel. If you are not eating at the adjacent Subway for lunch, bring your own plus a water bottle. There will not be enough time on class days to go any farther than the Subway restaurant next door for lunch. Q: How old do you need to be to become a certified Open Water Diver? To be a fully certified PADI Open Water Diver you must be at least 15 years old and there is no maximum age; however, children as young as 10 years old can become PADI Junior Open Water Divers. 10 and 11 year olds must successfully complete the same requirements as an adult student so you may want to consider private lessons for your child(ren). Once certified, 10 and 11 year olds must dive with a parent, a guardian, or a PADI Professional. Those 12, 13 and 14 years old must dive with a certified adult diver. 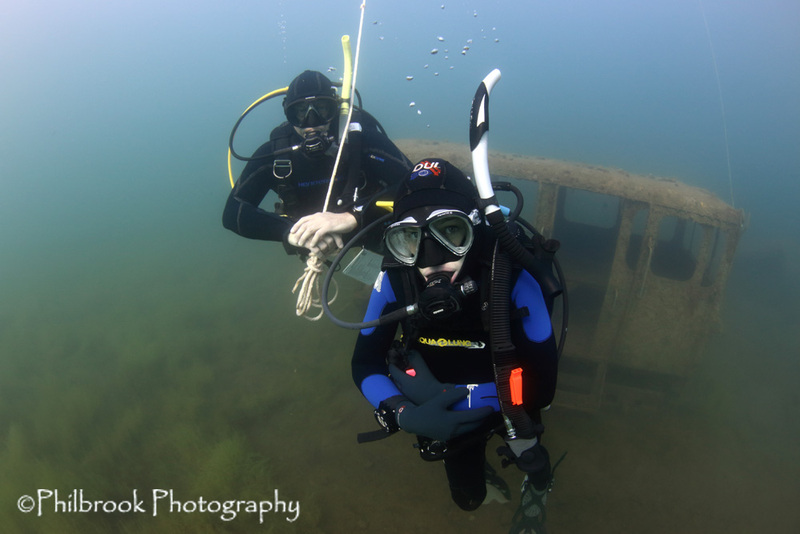 Once a Junior Open Water Diver reaches the age of 15, they may administratively apply for standard PADI Open Water Diver certification (this can be done here at the shop or directly with PADI). Q: Do I have to be a good swimmer? Not necessarily…you need only to be comfortable in the water and capable of swimming continuously for two hundred yards, and treading water/floating for 10 min. Q: What is required of me before the first class? If you purchased the textbook and DVD version of the course: Read the Open Water Manual and complete all of the quizzes along the way and the Knowledge Reviews at the end of each of the five modules PRIOR to your class. Your instructor will review the Knowledge reviews with you in class. If you purchased the online eLearning program: Complete all online coursework including all interim Assessments and the Final Assessment. Print out the verification of completion of your online coursework and bring it to class and turn it in to your instructor. Locate the “PADI Student Record File” in your blue packet and complete all of the required Student Profile and Emergency Contact information. Read all of the documentation and complete all of the paperwork as instructed by the shop and/or your instructor (Note: if you have any “yesses” on your Medical Statement, you must complete a separate RSTC Medical Statement and bring it to your doctor – see next question below). Please also bring two “head and shoulder”, passport-sized photos of yourself the day of your class. Q: What if I have a “yes” on my Medical Form? Safety is our number one concern. If you can answer “yes” to ANY of the medical questions, a separate PADI RSTC Medical Statement must be taken/sent to your physician for signature for permission to dive prior to you getting into the pool. Please call the shop if you have any questions. Note: if you do have any “yesses” on your Medical Statement and your physician clears you to dive, please make copies of the document as you may need to bring this for your referral dives or future dives with other shops. There’s no need to run around town! Your entire Part 1 scuba class will be held at Aquaventure Dive & Photo Center. This includes both classroom and pool portions of the class. Our on-site pool is a balmy 86 degrees. We are located in Maple Grove just northwest of Osseo on the north side of County Rd 81 in the same strip mall as a Subway restaurant. Our address is: 10024 County Rd 81, Maple Grove, MN 55369 (763) 424-8717. Yes, the PADI eLearning Open Water Diver Course replaces the textbook and provides the knowledge development portion. The classroom review and pool portion can be completed at Aquaventure. Q: How warm is your pool? A: Our pool is kept at a comfortably warm 86 degrees. Q: Are private lessons available? Yes. Whether you prefer one on one instruction, Semi-private instruction, or a private class for your family, private lessons can be scheduled to meet your needs. Call us for more details (763) 424-8717. Private/Semi-Private lessons are strongly recommended for 10 and 11 year olds or those feeling they need a bit more time and attention. Semi-Private lessons are also terrific for couples and families! We work to your schedule and needs. Q: How do I sign up for the class? You can simply call us and sign up over the phone with a credit card (pre-payment required) or stop in at our store. If you sign up over the phone you will need to stop in and pick up your student kit prior to class. Q: How does unlimited pool practice time work? We offer free pool practice time (including gear) to all of our students once they have successfully completed the Part 1 portion of the Open Water class. We view this as a class extension only to these students. Once the student has successfully completed their Open Water certification (Part 2), the free pool time offer expires. Free pool time is designated for Tuesdays from 11:00am – 6:30pm. We know of no other shop that offers this extraordinary value-added opportunity. Coming in to practice one, two, or even 3 times prior to your Open Water Training Dives tends to make a world of difference – practice makes perfect! Course fees are due upon class enrollment to guarantee your space in the class. Classes are non-refundable within 14 days of the class start date and non-transferrable within 7 days of class start time. One transfer is allowed for a fee of $90. All course fees are forfeited if you do not attend.